Ladies Who Lift – finally, a class that teaches proper strength training, by women, for women! Ladies Who Lift is a comprehensive group coaching session, for women who want to know how to weight train properly in the gym. We help women feel confident that they are weight training with excellent technique, in a way that is safe and will get results. 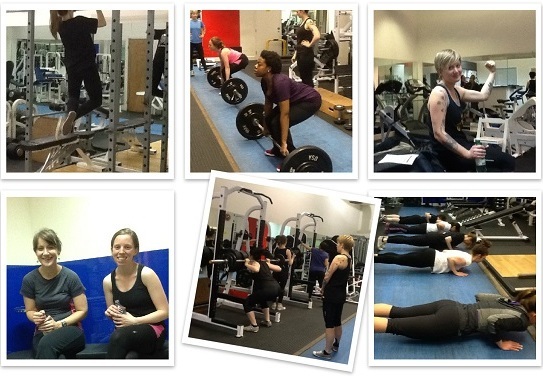 Ladies Who Lift is London’s longest running women-only weight training class! We’ve been getting women strong since 2011. Save up to £45 per hour on the cost of expert personal training by taking our women’s weight training classes. The same coaching and support for a fraction of the investment. 1 Beginners Workshop – Help, I’m new to all this! You want to have amazing long term health and fitness. You’ve heard that lifting weights is important, but you’ve never done anything like it before, and you don’t even know if you’ll like it. You’d like to try it out in a safe and friendly environment, with other people who are in the same situation. 2 Beginner – I want to start lifting weights! You are new to exercise or you have tried other forms of exercise before but you haven’t got the results you really wanted. You are tired of feeling weak, constantly getting injured, and just messing around in the gym. You want to learn how to lift weights properly so that you can train with confidence and feel like you are getting somewhere. 2 Intermediate – I’ve lifted before but I need coaching! You love lifting but you struggle to find people to train with at your gym and coaches who know their stuff and understand what you want. You want to stay motivated and accountable so that you can make real progress even when life gets in the way.